I arrived at the event at 12:30 ish to find Aypok and Peter (Aypoks mate) setting up an SMS. 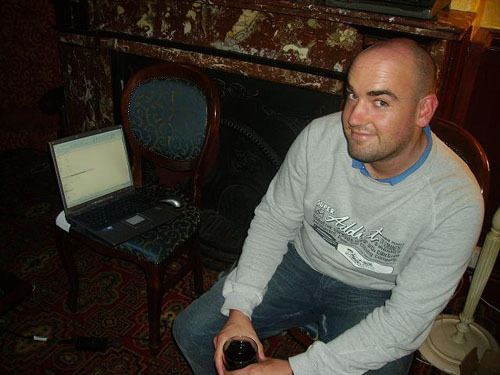 I recognised him from his forum picture so we didnt have an embarrassing 'who are you' incident. 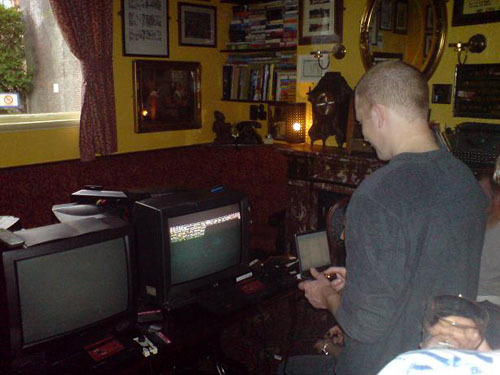 I set to work setting up the couple of SMS's I had brought with a bit of technical assistance from Gareth (profpeach/ pub guy) as I couldn’t find the scart channel using the remote. I had also brought with me a paddle controller and western carts of Woody Pop and Alex Kidd BMX Trial, reproductions by the way. (RetroReserve nearly had an aneurism when he spotted the Woody Pop cartridge). My 1st of 5 pints was ordered at this point, I’m not the shy-ist person but It's actually pretty nerve-racking meeting people who you feel you sort of know but have never actually met before, a strange feeling. Retro Reserve arrived soon after whom I also recognised from his picture. Mr. Reserve then left to go and check into his hotel. Now my memory is pretty sketchy on this but I don’t think anyone else showed up till way after 1:00. I started to get a little worried as I thought perhaps nobody was going to show up. My worries were soon dispelled as Phil walked through the door, I have never seen a picture of Phil but straight away.. "I'm Phil". After this point I can’t really remember the order of arrivals. I knuckled down to abit of Putt and Putter practice as Aypok was giving Peter a run through of some of the games in the comp. Then it was Maxim, I was pleased Maxim made it as he isn’t a regular sega8bit poster but I had spoken to him quite allot over on SMSPower + correct me if I'm wrong, he had the furthest to travel, all the way from London. He brought with him a Wii with SMS emulation which I found to be much better than I thought it would be. Kiff and Ninjabearhug arrived and I didn’t recognise either of them! At first I thought they had just come in the pub for a drink and popped through to see what we were up to, then Ninja introduced himself.. looked nothing like his picture! So then I assumed Kiff was Ninja's friend whom he was supposed to be bringing, oops.. sorry kiff. I realised soon after when you were speaking with Playgen.. who I also didn’t recognise! lol. Also thanks to Kiff for bringing a box full of free SMS goodies for people to take away, that was a great idea and I wish I had done the same. Playgen was last to arrive as he had a spot of car trouble on the way down. I’ve spoken to playgen quite a lot over MSN so I was really glad he made it over to the event. I just want to add at this point that I found everyone to be great to speak to, it seemed like a real mix of people (even though we were all of similar age, male and white) but from what I could see everyone appeared to be really getting on well together. For me that was really what matters about this kind of thing, not really the gaming at all. 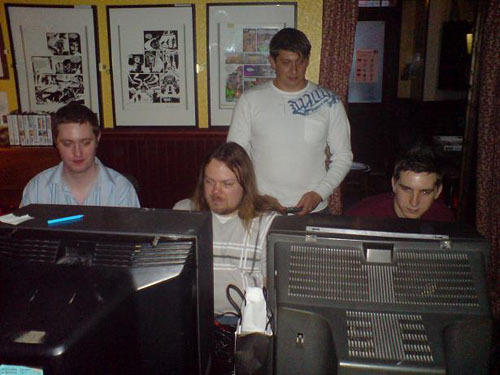 (left to right) Phil, RetroReserve, Ninjabearhug and Ian all deep into intense SMS action! Ian won pretty much every round with just Maxim and RetroReserve winning one round each. I really thought I would win at least one round, but I was up against some pretty seasoned SMS professionals. 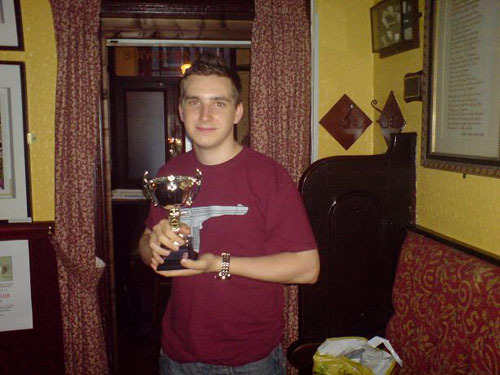 Winner of the first Stepanic Cup! I would have liked to have stayed later into the evening and had a drink with the people who didn’t need to catch trains etc, I felt kinda bad leaving Ian and RetroReserve as they were staying over in Manchester and I was the local person who could have shown them around, sorry guys. 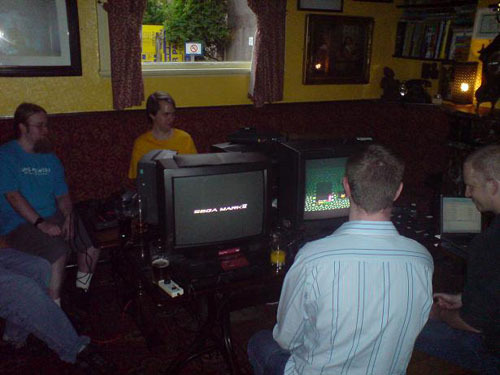 Hopefully I will be able to get a hotel for Sega8bit '09 wherever that is held. 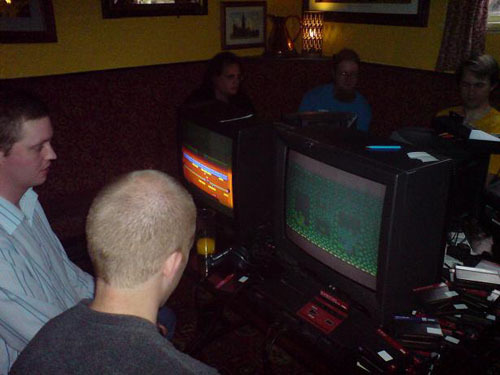 I can only see the sega8bit events getting bigger and better after this great 1st year.